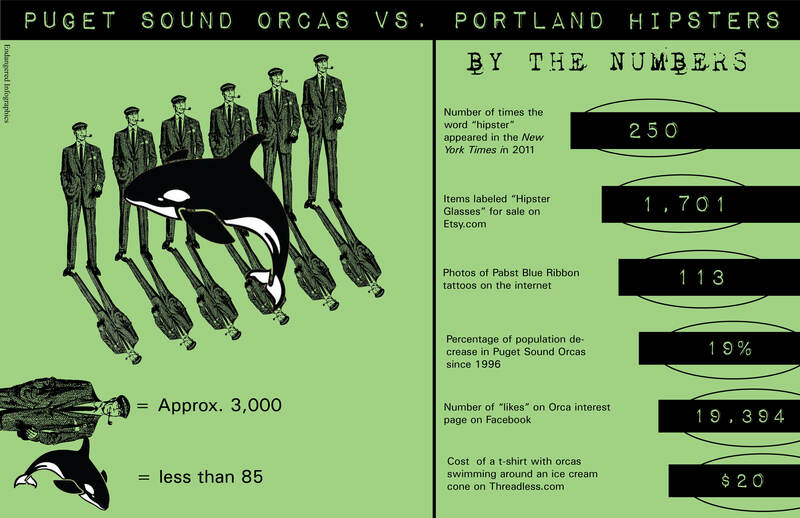 Pudget Sound Orcas Vs. Portland Hipsters by Earth First! Newswire is licensed under a Creative Commons Attribution 3.0 Unported License. POPULATION TREND: Southern resident killer whales have experienced alarming population instability during the past 30 years, indicating that the population is unsteady and oscillating toward extinction. Since 1996, the population has experienced a steep drop, going from 97 to 78 whales. This is exactly the kindof post that encouraged me to shut my FB account, I’m totally on the side of the whales, but maybe if the Anarchist Scenesters in the USA could stop worrying about hipsters, toughen up and actually fight, instead of just going to parties and dressing cute, stop paying their taxes, loans, bills, shut their bank accounts and credit cards, etc, maybe we could save some of the whales before we’re all eradicated by the commodity spectacle!